If you look in the upper right-hand portion of your screen, you'll see a small blue tab that pulls down to show our address and a link to us on google maps. Also, for information on our services and history, see the "about" page under the Info menu tab. 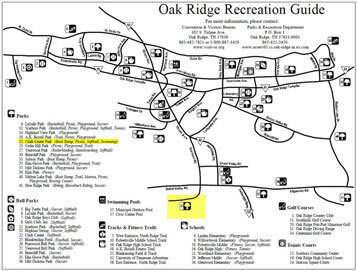 The rest of the information on this page pertains to finding your way to needed services in Oak Ridge. Local Transportation - Oak Ridge doesn't have a city bus system, but has a Taxi service as well as a bus for citizens with special needs. Check the Chamber website for information on local attractions, directions, business information, and general information. Located at the American Museum of Science and Energy, the Visitors' Center is packed with pamphlets and helpful people. Check out the Center's website. Clark Center - marked in yellow on the Recreation Center Map below - click on the map for a larger version. Find a wealth of information and resources for visitors at the City Government website. The local paper is managed by the Knoxville News Sentinel and is called The Oak Ridger. Check their website for local stories, classifieds, and more. Oak Ridge serves as the regional medical center for several counties. Here is a partial listing of immediate care providers that could be needed by out-of-town guests.